The first voyagers who venture to Mars and seek to live on soil beyond our terrestrial home will face an environment mismatched with the one in which their genomes, epigenomes, and psyches evolved. Even if technical hurdles are circumvented to provide adequate resources for basic physiological needs, Homo sapiens will not survive on an alien land if a fracturing psychology prohibits the utilization of these resources. 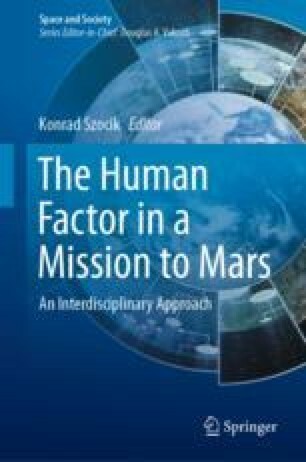 Environmental psychology can be employed to shape the choice architecture of a vessel to Mars and a colony upon it, in order to bias choices toward the fulfillment of fundamental existential, relationship, safety, and fitness needs. Aspects of surroundings that should be engineered to create psychological states optimal for survival and welfare include primes, defaults, private spaces, shared spaces, ceiling height, object shape, color, nature, pets, light, windows, noise, temperature, odors, contaminants, order, and diversions. No matter how far we soar into the stars, our psychologies will be ever tethered to the totality of our surroundings. By shaping our environments, we indirectly shape our psyches and prepare them for a mission of unprecedented alienation and duration which might be the last best hope to avert the end of our kind. National Institute of Mental Health. https://www.nimh.nih.gov/health/statistics/suicide.shtml.